Submitted 1 month 2 weeks ago by torture_tester. 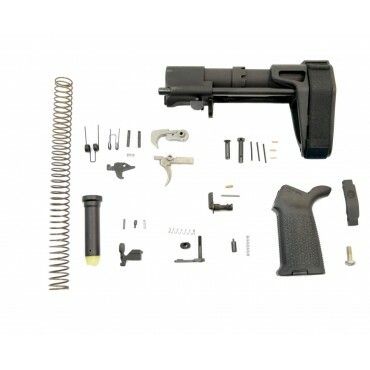 SB Tactical PDW Pistol Brace: The SBPDW Pistol Stabilizing Brace is 3-position adjustable and compatible with mil-spec bolt carrier groups and carbine buffers. US veteran designed, and proudly made in the USA. Magpul MOE Grip & Trigger Guard: The MOE Grip (Magpul Original Equipment) is a drop-in upgrade for the standard AR15/M4 pistol grip. The ergonomic, hand filling design combines anti-slip texturing with storage core capability. The MOE Trigger Guard (Magpul Original Equipment): an enhanced polymer drop in replacement for the AR15/M4 weapons platform. PSA Enhanced Polished Trigger (EPT): We start with our standard single-stage government-style fire control group, finely polish the contact surfaces and then coat the hammer and trigger in a super slick nickel finish. The result is a trigger that is substantially smoother than mil-spec. A great economical upgrade. FREE Shipping!